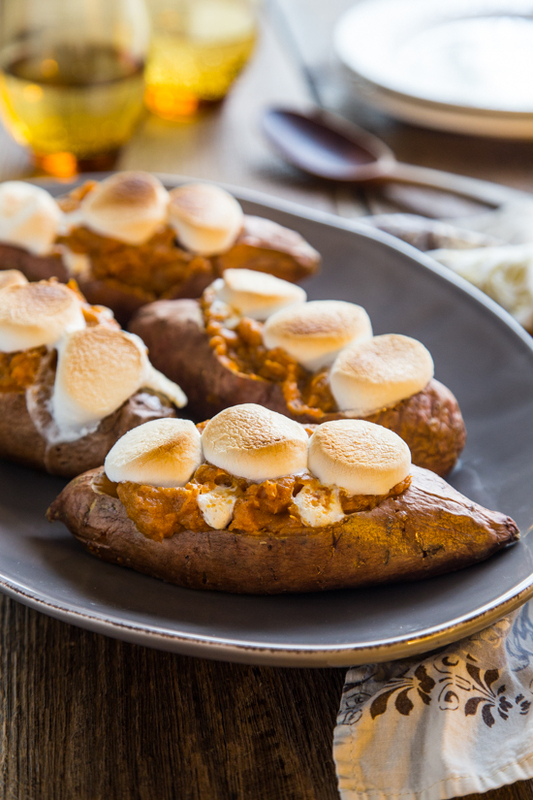 Twice baked sweet potatoes filled with brown sugar, spices and Campfire® marshmallows are the perfect comforting side dish for your Thanksgiving table. Fill the shells ahead of time and top with marshmallows and bake the day of for a great make-ahead recipe. Happy November to you, my fellow fall loving friends! I have to admit that I’m a little sad to see October go. The leaves have fallen providing us with lots of leaf-jumping fun, the candy has all been passed out (and eaten) and now we’re officially into the month where it is socially acceptable to listen to Christmas music. I can hold off until November 1st and then all bets are off. I don’t see any problem decorating and cooking with Thanksgiving on the brain all while listening to a little Sleigh Ride. To me, the two go hand in hand. It’s not as if Thanksgiving music exists to listen to while roasting a turkey or baking a pumpkin pie. So, Santa jams it is. Admit it, you love it too! Two years ago, I started shared some of my ultimate Thanksgiving staples: roasted turkey breast with bacon and herbs, sausage filling and cranberry relish. This year, I wanted to keep rounding out my Thanksgiving recipe list starting with these delightfully sweet, twice baked sweet potatoes topped with toasted marshmallows. Who doesn’t love toasted marshmallows? These lovely little boats are basically individual sweet potato casseroles, not to mention incredibly easy to make. The presentation of serving the sweet potatoes back in their own shells will be sure to delight your dinner companions. Plus, I decided to use two different sizes of Campfire® marshmallows to up the sweetness factor. 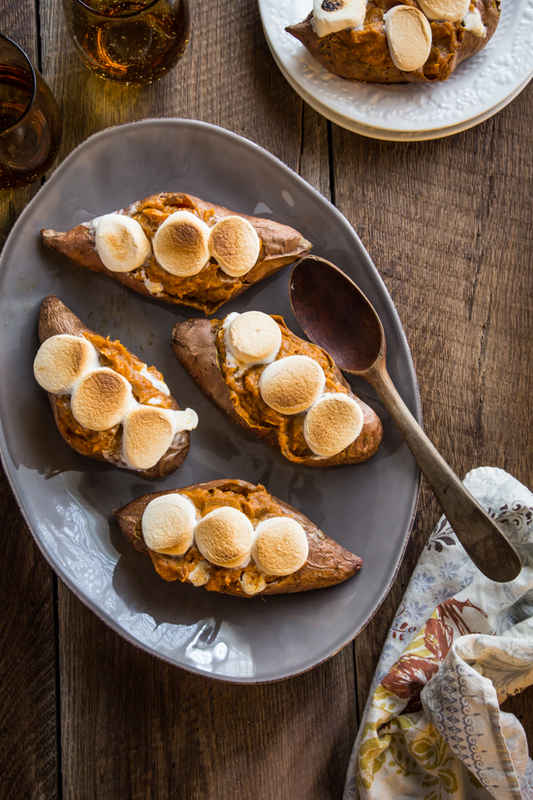 Mini marshmallows get mixed into the potato, while halved marshmallows get placed on top to create a toasty, s’more like top to these twice baked sweet potatoes. These are so my ultimate Thanksgiving sweet potatoes! As you might remember from my Halloween Marshmallow Treats, I’ve teamed up with Campfire® Marshmallows to share delicious, seasonal recipes featuring their incredibly delicious marshmallows! 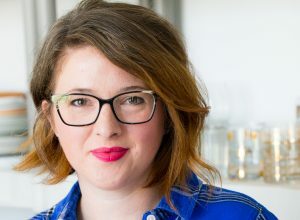 Earlier in the week, Jamie shared her family’s recipe for Cranberry Fluff that brings me right back to my childhood – in the way that only comforting food can. We are also going to be joined this month with some of our favorite blogging friends who will share their favorite fall and Thanksgiving inspired recipes, just in time to help inspire your Thanksgiving menu. For more information about Campfire® Marshmallows, visit their website or find them on Facebook and Pinterest. And don’t forget to check out our incredible Marshmallow Madness Pinterest board for more marshmallow inspiration. Preheat oven to 375 degrees. 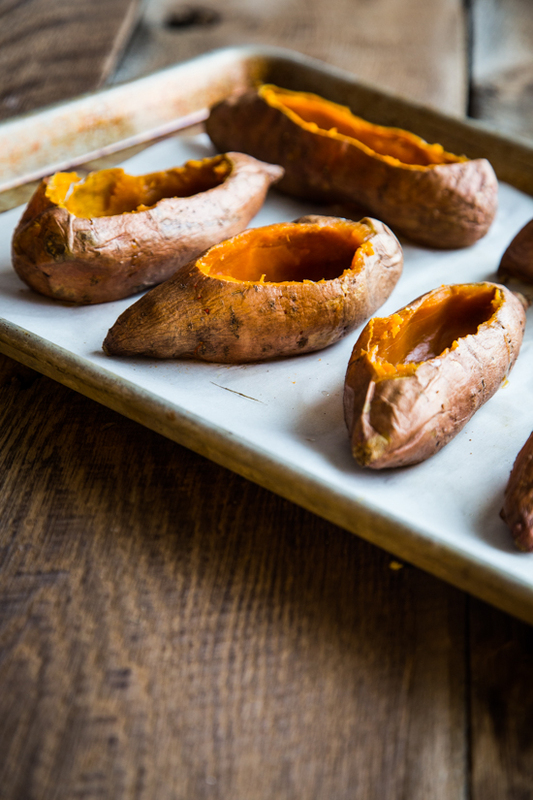 Rub sweet potato skins with olive oil and place on parchment lined baking sheet. 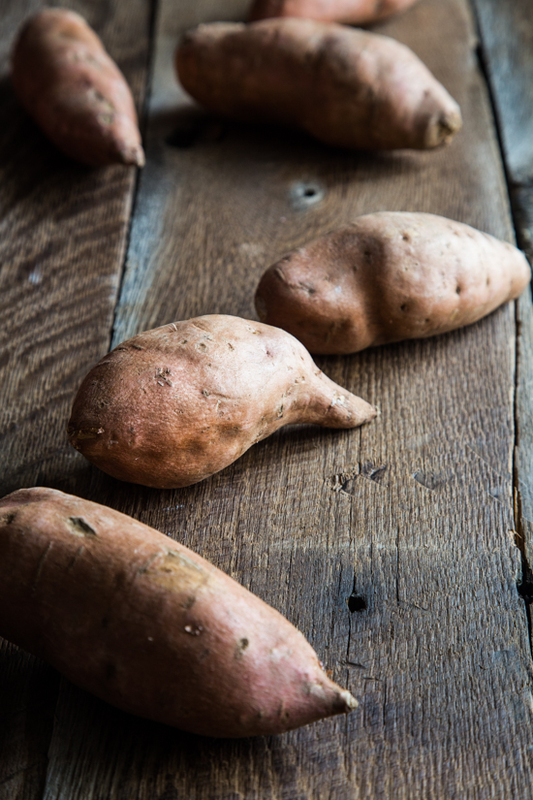 Bake for about 45-60 minutes or until sweet potatoes are cooked through. Remove from oven and allow them to cool until easy to handle. Reduce oven temperature to 350 degrees. When potatoes are cool enough to handle, carefully cut off the top 1/2 inch of each potato, lengthwise. Discard the tops. Using a spoon, carefully remove the flesh of the potatoes, leaving a small amount along the inside of the skins to help hold the shapes of each potato. In the bowl of a stand mixer fit with a paddle attachment, mix together sweet potato flesh, butter, brown sugar, vanilla extract, cinnamon, nutmeg and allspice until smooth. Gently fold in 1 cup of mini marshmallows with a spatula. Divide mixture back into the potato skins and top with halved marshmallows or additional mini marshmallows. Bake for 15 minutes or until filling is heated through and marshmallows are melted. Turn on the broiler for about 1 minute to toast the tops of the marshmallows. 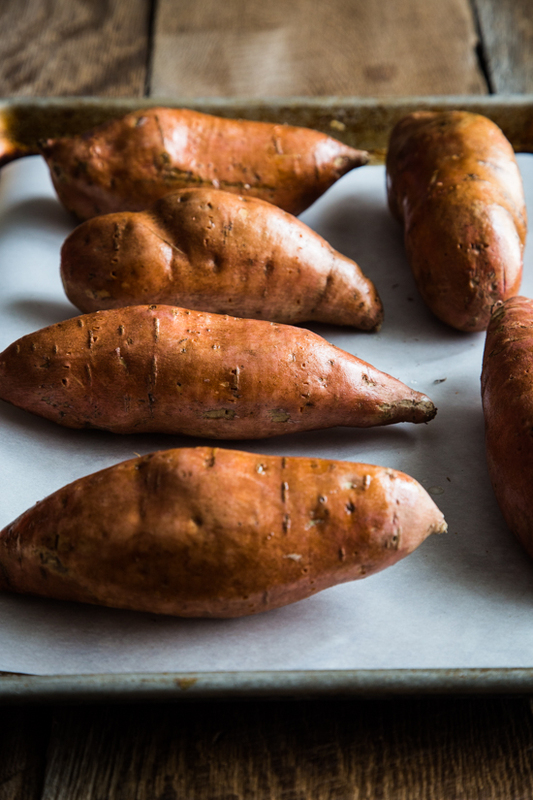 Sweet potatoes can be baked mixed and filled the day before serving. On the day of your dinner, top each potato with the marshmallows and bake at 350 degrees for about 25 minutes or until heated through. Broil for 1 minute to toast the tops of the marshmallows. I am obsessed with these. 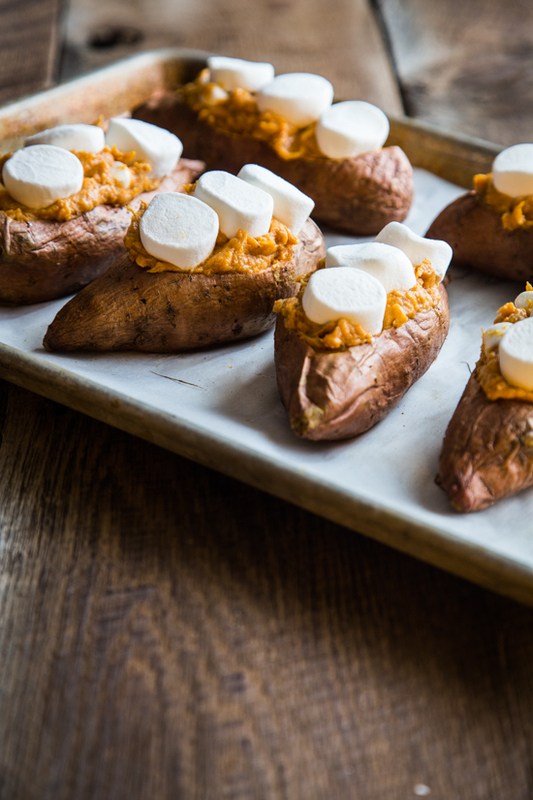 I mean, I LOVE sweet potato casserole…but anything in a mini version is totally my jam, so I kind of want to marry these little boats of sweet potato marshmallow goodness. Pinned! Thanks so much, Taylor! I’m am obsessed with mini anything, so I totally hear you on that 🙂 Thanks so much for stopping by! These look amazing, beautiful pics too. Well aren’t those some pretty sweet potatoes! Sweet, gooey and perfect. Such a fun idea! I bet these taste amazing too! Thanks so much, Jenna! Yes, they a great way to serve sweet potatoes, that’s for sure 🙂 Thanks for stopping by! Love those toasted marshmallows on top! Ohh yes we are already into Santa music and everything Christmasy!! Bring these on! Never tried sweet potatoes with marshmallows before, I’m definitely curious to know what these taste like! They look and sound delicious though. Looks amazing!! Might have to try this rendition for Thanksgiving!! Thanks for sharing! These were so yummy! Easy too!